If you could afford to build your very own Batcave, would you use it as a headquarters for your crimefighting activities? Or would you turn it into a gorgeous home theater, where gargoyles stare down at you while you enjoy a Batman movie marathon? 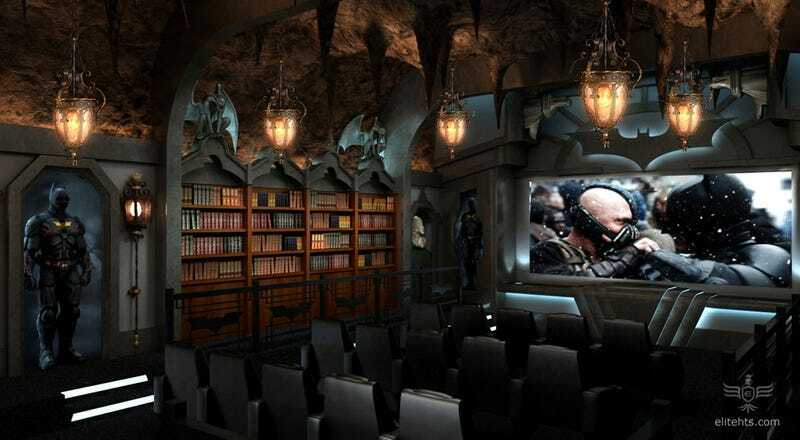 Elite Home Theater Seating, which provided the seats, posted these photos renderings of a home theater for the ultimate Bat-fan. This art deco-inspired theater includes a tunnel exit, an elevator, and Batcomputer displays. As if all that wasn't enough to let you pretend you're about to go out and battle Bane, those bookshelves slide out of the way to reveal a Bat Tumbler and wall of Bat weapons. The real question: where will this home theater be and how can we convince the owner to let us in for a movie or two?